Since 1949, German political parties have apparently operated under very favorable conditions. One of the foremost articles of the Federal Constitution (which was framed almost exclusively by former party politicians who survived the terror of the Nazis) secures them a guaranteed role in the political process and grants them special privileges.1 More important for their day-to-day business is an extensive system of state-funding2 and their de-facto control over access to the electoral arena.3 Last not least, they have gained much more than a foothold in the higher ranks of the civil service, including the public broadcasters that still control a large share of the radio and TV-market. Despite the traditional anti-partisan affect that had troubled the German polity since the 19th century, the Federal Republic clearly evolved into a party state during the 1950s. While parties as institutions flourished, there is empirical evidence that citizens took a skeptical view of parties and party politicians during the post-war period (see Kepplinger 1998: 23-26 for an overview). But by the 1970s, the new arrangements were widely accepted by the public. Not only had the Christian Democrats4 (CDU/CSU), Social Democrats (SPD) and Liberal Democrats (FDP) – the only parties represented in the federal parliament from 1961-1983, collectively known as ‘Bonner Parteien’ after the former seat of the federal government – gained sizable numbers of new members by then. They also had managed to attract a combined share of 99 per cent of the vote all through the 1970s, with turnout exceeding 90 per cent of those eligible to vote. Given the considerable degree of fragmentation in the Weimar Republic’s and the early Federal Republic’s party system and the fact that Germany’s electoral system is basically proportional, this success is even more impressive. Looking back, the 1970s were obviously a golden age of party government in Germany. This not withstanding, the late 1970s also gave rise to a new discourse of crisis, not unlike the older discourse on ‘ungovernability’, in which political scientists, politicians, and citizens alike have been involved ever since then. This discourse centers on the notion of ‘Verdrossenheit’ in its numerous varieties, among which ‘Politikverdrossenheit’, ‘Parteienverdrossenheit’, and ‘Politikerverdrossenheit’ (disaffection with politics, parties, and party politicians, henceforth simply Parteienverdrossenheit; see Eilfort 1996 for an attempt to translate this terminology) are the most notorious. More than 180 chapters, refereed articles, and scientific monographs have been published on the subject since 1977, with their numbers still growing (Arzheimer 2002). With rising levels of education, partisanship loses its ‘functional value’ for the average person (Dalton 1984).7 Citizens who have a good knowledge of political concepts and facts and are able to process this information do not rely on the framing of politics that parties provide. This is the effect of cognitive mobilization. Traditional groups (workers, Catholics, church-goers) shrink, while new groups that are not aligned to a particular party (e.g. the ‘new middleclass’) grow in size (Gluchowski and Wilamowitz-Moellendorff 1998). Therefore, fewer and fewer citizens live in a context where social norms structure individual support for parties. This is the effect of changing composition of the society. the rank-and-file members of these groups are less likely to follow the cues (Dalton et al. 1984), since welfare-state policies have reduced the tensions between social groups, individual (Crouch 1999: 20-26) and value based concerns (Inglehart 1984; Kitschelt 1994; 1995) become more relevant, and special-interest groups and the media assume some of the parties’ functions (Dalton 2000: 29). For the same reasons, new generations born into those groups are less likely to internalize the groups’ norms and traditional loyalties during their formative years. Regardless of the precise mechanism, this is the effect of a weakening of traditional social ties. Of course, this catalogue is not necessarily exhaustive, and complex interactions between these three effects are conceivable, but the general thrust of these arguments suggests a slow and gradual decline of partisan ties because dealignment is by and large a consequence of secular changes and population turnover. On the other hand, authors who are concerned about ‘Parteienverdrossenheit’ often assume that a rather swift and permanent breakdown of party attachments has already occurred.8 Surprisingly, from the literature on ‘Parteienverdrossenheit’ it remains largely unclear whether there is any empirical evidence for such a fundamental change in the relationship between citizens and parties. Christian Democrats, Social Democrats and Liberal Democrats have survived the onslaught of the Green party that was founded in the early 1980s as well as the attacks by the new parties of the Extreme Right and the post-communist PDS in the years after German unification. Despite a substantial loss in their membership and increased public criticism, they still attracted roughly 85 per cent of the vote in the 2002 Bundestag election – more than 25 years after the first papers on ‘Parteienverdrossenheit’ appeared. Therefore, the (reiterated) reports of their deaths may be slightly exaggerated. Conversely, their continuing rule does not imply that the supposed change in the citizen-party-relationship has failed to materialize. Some authors (e.g. Kepplinger 1998: 24) argue that the situation in the 1990s resembles the setup of the 1950s in a remarkable way. After all, parties may very well prosper although they are detached from the public (see Katz and Maier 1995 for a radical version of this argument). The relative electoral success of the established parties does not rule out this possibility. It is entirely plausible that partisanship is declining – either gradually or swiftly – and that citizens simply keep voting for the same old parties for entirely different reasons. The point is, if one wants to know whether partisanship in Germany has actually declined over the years and if so, which pattern this decline has followed, the literature is at best inconclusive, because authors working in this field rarely employ appropriate data. While scholars concerned about ‘Parteienverdrossenheit’ often hypothesize that support for parties has dropped over the course of a couple of months or maybe years, their vast majority relies solely on data from cross-sectional studies. If trend data are employed, these time-series typically encompass six to seven time points at the maximum. Although cross-sections and short time trends may provide interesting snapshots of political reality, they are clearly inadequate for the research question at hand: One can simply not assess long-term change if one has no information regarding the past level and dynamics of the respective variable. Fortunately, such information exists and is accessible to the scientific community. Since 1977, ‘Forschungsgruppe Wahlen’ (FGW), a company from an academic background, has conducted its monthly ‘Politbarometer’ polls on behalf of the public broadcaster ZDF. This survey includes what has become the standard question (Falter et al. 2000b: 241)9 for tapping party identification (henceforth PID) as conceived by the social-psychological model (Campbell et al. 1960) and is therefore ideally suited for investigating whether and how the relationship between citizens and parties might have changed since the late 1970s when the discussion on ‘Parteienverdrossenheit’ began. The Politbarometer series of surveys started in January 1977, and information on PID has been collected since March 1977. Prior to August 1988, respondents were selected from the population entitled to vote by multi-stage probability sampling and were interviewed face-to-face. From August 1988 on, respondents were interviewed by telephone, with the phone numbers created by RDL. Since 1990, citizens from Berlin and from East Germany were interviewed as well, but the PID question was introduced in East Germany as late as April 1991. Due to deficiencies in the East German telephone system, respondents were interviewed face-to-face until 1994. Since there are vast and persistent differences between the political cultures of East and West Germany (see e.g. the chapters in Falter et al. 2000a), East German respondents were excluded from the analyses in this article. The Politbarometer poll is usually conducted every four weeks, but until 1998, FGW would regularly skip one of the summer months. Conversely, during the weeks preceding an election FGW normally polls the public’s opinions every fortnight, so that there are 11 to 14 samples per year. For the period from January 1977 up to December 2002, these data were harmonized and partially cumulated by the Central Archive at the University of Cologne.10 After deleting respondents who claimed to be East Germans but were included in the West German data sets, 280,732 citizens from West Germany who had answered the PID question remain. Figure 1 shows the percentage of party-identifiers in Germany from 1977 to 2002 as measured by the Politbarometer series of opinion polls. From the literature on ‘Parteienverdrossenheit’, one would expect PID to fall dramatically (say by 20 percentage points or more over a short period) and never to recover. But the time series seemingly fails to exhibit such behavior. While it is readily seen that PID has somewhat declined in West Germany – the share of identifiers is clearly higher in the late 1970s than in the late 1990s – there is no indication of a sharp, sudden and permanent ‘drop’ in this figure. For instance, the largest month-to-month decrease of 9.5 percentage points occurred in August 1981. However, in July 1981 the number of identifiers had risen by 4.2 points and it rose again by 4.6 points in October. If one looks at the whole year of 1981, the net change is a mere -0.004 percentage points. Moreover, the longest spells of consecutive negative changes persisted for only four (November 1995 to February 1996) and five months (July to November 1998) and amounted to a net change of no more than -3.1 and -2.2 points respectively. Rather than being swept away, party identification seems to decline slowly and constantly, random noise and short-time fluctuations of a mostly moderate size which might be due to political events notwithstanding.11 Thus, the Politbarometer series seems to speak against crisis theory. Of course, instead of jumping to conclusions one would seek to formally model a trend and then test which of the three hypotheses in table 1 is supported by the data. Surprisingly, the Politbarometer polls have been largely ignored by most scholars interested in ‘Parteienverdrossenheit’, and only two amongst the publications surveyed by Arzheimer (2002) have formally analyzed the series. Both Maier (2000) and Falter and Rattinger (first published in 1997; updated in 2001) employ OLS to extract a trend from the aggregated series, i.e. they regress the monthly share of identifiers on time. By comparing the coefficient for the whole series with a coefficient estimated for the post-unification period separately, they conclude that PID is declining slowly but significantly over time, and that this decline has accelerated after 1990 (Falter and Rattinger 2001: 487-490).12 Since this procedure yields an R2 in the range of some 40 percent, they assume that their model adequately captures what is going on. The sample sizes vary between 805 and 2,971 observations with an average of 988. Analyses of the aggregated series should take the greater reliability of the larger samples into account, e.g. by weighting or by Kalman filtering (Green et al. 1999). Time series are usually fraught with serially correlated errors (see note Error: Reference source not found), which will in turn lead to overoptimistic confidence intervals and significance test. Informally comparing the overall coefficient with a coefficient calculated for a specified period is mere eyeballing.14 An appropriate test for a structural break would specify variables that encode the assumed change. By aggregating over time, all individual information that could explain why some citizen at some point in time identifies with a party or not is discarded. Fortunately, these problems can be avoided because there is actually no need to analyze the aggregated time series. Rather, one can make use of the data in their original form, i.e. pool the samples and model the individual probability for registering a PID (or rather the logit of this probability) depending on time and other factors. Table 2 shows the coefficients for four alternative specifications of such a logit model. Model 1a corresponds to the dealignment hypothesis and can serve as a baseline: In this formulation, the logit of the probability for stating a PID depends simply on a constant (that is the log-odds of the estimated probability for holding a PID in March 1977) and a trend that captures the monthly decline in these log-odds.15 Model 1b is an individual level reformulation of the aggregate model proposed by Falter and Rattinger, which assumes that the probability for stating a PID as well as the velocity of partisan decline have changed after unification. If a structural break has indeed occurred, it will be captured by the dummy variable and the product term that were added to the equation.16 Model 1c is basically identical with 1b but assumes that the break occurred one year later, when the general public became fully aware of the political and economical problems induced by unification, ‘Politik- und Parteienverdrossenheit’ was chosen as ‘word of the year’ by the German language society and – with a delay of one year or so – a huge number of articles on this phenomenon were published. Last not least, Model 1d assumes that a break occurred much earlier, namely in 1982 – a year of intense political conflict (which eventually led to the break-down of the SPD/FDP majority in the Bundestag and the highly controversial formation of the new CDU/CSU/FDP government) that witnessed a first peak (Arzheimer 2002: 102) in the number of publications on ‘Parteienverdrossenheit’. First and foremost, the results confirm that the number of identifiers is indeed declining since the trend-terms in all four models are negative and significantly different17 from zero. Therefore, the hypothesis of no change can be rejected. Moreover, the negative coefficients for the dummy variables show that the early 1980s as well as the early 1990s witnessed indeed some ‘drop’ in the number of identifiers. Apart from that and contrary to the findings by Maier, Falter and Rattinger, the downward trend was a bit shallower after unification than before since the coefficients for the product terms in models 1b and 1c are positive. More important, however, is the fact that these structural changes have very little substantive impact. Once the results are converted back from the logit-form to the quantity of interest (that is the probability for holding a PID), all four specifications yield virtual identical18 predictions, which amount to a slow19, almost perfectly linear decline in the share of identifiers, and rather small ‘drops’ of less than 2 percentage points (see figure 2).20 In view of that, Model 1a is probably a reasonable yet parsimonious approximation of what is going on. Moreover, even for the late 1990s, the estimated share of identifiers is still in the range of about two thirds of the adult population. Taken together, these figures are much more in line with the idea of a gradual and fairly constant dealignment than with the notion of a swift breakdown of the link between citizens and parties that is implied by the discourse of ‘Parteienverdrossenheit’. But which of the three effects discussed in the introduction – cognitive mobilization, change in the composition of society, or weakening of social ties – is most likely to have caused this dealignment? Consequently, one must assume that partisanship is in decline because of a change in the composition of society or a weakening of traditional social ties. This becomes even clearer if one looks at which parties the respondents identify (or rather stop to identify) with: The decline affects basically the two major parties – Social Democrats and Christian Democrats – which represent the two most important cleavages in German society, namely class (Pappi 1973) and religion (Pappi 1973; Roberts 2000). Together, these two parties still make up for roughly 90 percent of all party-identifiers. But while the small share of citizens who feel attached to one of the minor parties has been stable or even slightly growing over the 26 years covered by the Politbarometer, it is the decline in the number of citizens who identify with either Christian or Social Democrats that is responsible for the overall change. Therefore, it is highly plausible that partisanship has declined because the traditional social groups have lost some of their political significance. Since the social groups that have disproportionally supported the major parties are well known – workers on the one hand, Catholics and (since ca. 1970) regular churchgoers in general on the other – these conjectures are readily tested. First, it must be noted that all three groups indeed suffered numerical losses between 1977 and 2002: the share of Catholics fell from 44 to 39 percent, the number of frequent churchgoers23 was reduced from 23 to 16 percent, and the share of workers24 plummeted from 39 to 21 percent.25 This change in the composition of German society alone would have led to a substantial decline in partisanship, provided that Catholics, workers and churchgoers kept their traditional loyalties. To see whether this is indeed the case, citizens who identify with one of the minor parties were excluded from the analysis so that the dependent variable is 0 for no PID at all and 1 for identification with either Social or Christian Democrats.26 Then, model 1a was augmented with two dummy variables that indicate whether a respondent is a worker or not, and whether he or she is a Catholic. A six-point-scale measuring church attendance ranging from 0 (never) to 5 (every Sunday) was added, too. All three corresponding coefficients should initially have positive signs. To test whether the strength of the respective effects is stable or fading over time, interaction terms between these three variables and time were formed and inserted into the model as well. If group memberships lose their political significance over the years, these interactions will have negative signs. The results, which are largely in line with the expectations, are shown in table 4. Their interpretation is somewhat complicated by the presence of interaction terms but becomes straightforward once the usual rules are applied (see e.g. Jaccard 2001). First, the constant represents the predicted log-odds for the reference group of citizens who lack the traditional social ties, because they are not workers, are not Catholic and do never attend church. As can be seen by reversing the logit transformation, even within this group, the predicted probability for identifying with either Social or Christian Democrats was about 72 percent in March 1977. The coefficient for time presented in the first line of the first block is an estimate of the (negative) trend within this group. By multiplying this figure with the number of months between the first and the last survey (310), it is easily shown that the log-odds for this group fall to 0.362 over the period under study, which is equivalent to a predicted share of 59 percent party identifiers. Second, the coefficient for (non-Catholic) 29 workers which is shown in the second line of the first block indicates that the log-odds for this group were – as one would expect from cleavage theory – somewhat higher than for the reference group in 1977. The negative sign of the interaction between being a worker and time (first coefficient in the third block) tells us that this difference gets significantly smaller every month. It actually becomes significantly negative from about 1991 on. Being a (non-practicing)30 Catholic did not significantly raise the log-odds of holding a PID compared to the reference group in the late 1970s, as can be seen from the coefficient in the third line of the first block, and again, even this weak effect fades and then reverses over time (see the coefficient in the second line of the third block): From ca. 1984 on, non-practicing Catholics were less likely to identify with a major party than the reference group. The interaction between being Catholic and being a worker (shown in the first line of the second block) is significantly negative. In line with the considerations on cross-pressures, the effects of being a worker and being Catholic do not sum up but rather seem to cancel each other out, at least for those Catholics who do not attend church. This negative interaction does not significantly vary over time, as can be seen from the coefficient for the first of the three-way interactions in the last block of the model. 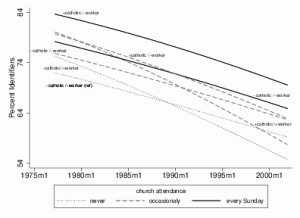 The picture changes markedly once church attendance comes into play. Even for marginal churchgoers, the log-odds of identifying with one of the major parties rise substantially (last line of the first block). Besides that, the coefficient for the interaction between Catholicism and church attendance (in the second block) indicates that the effect of Catholicism becomes statistically and substantially significant once a citizen practices his or her faith. 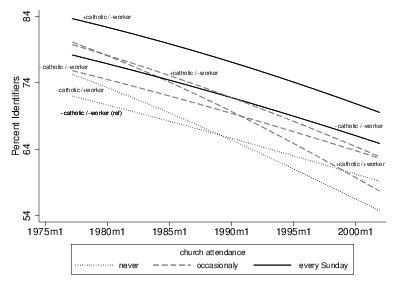 Both the main effect of church attendance and interaction with Catholicism are largely stable over the years as can be seen from the non-significant coefficients for the interaction between church attendance and time and the second three-way interaction respectively. The reference group of citizens who are neither Catholic nor working class and does never attend church. Catholicism still has an effect, too, but only for those citizens who attend church very often, as can be seen from the gap between groups 3 and 4. This gap amounts to a difference of about five percentage points for the whole period. On the other hand, for those comparatively large groups of citizens who are not workers and attend church only occasionally (i.e. for Christmas, Easter, baptisms, and weddings), it makes almost no difference whether they are Catholic (group 5) or not (group 6). Among group 5, the estimated share of identifiers was roughly four points higher than among group 6 in 1977, but this margin has considerably shrunken over they years. Since the mid-1990s, both groups are almost indistinguishable. Wrapping things up, we can conclude that the relationship between membership in traditional social groups and PID is indeed weakening. This is least obvious in the case of church attendance, since the respective shares of partisans among frequent, occasional and non-churchgoing citizens move down in unison. Things are more complicated in the case of Catholics, because the effect of religion depends on the level of religious practice: While being a Catholic still makes a difference for those who attend church frequently, it hardly affects the likelihood of having a PID among less devout citizens. Lastly, the political effect of class on partisanship which was still present in the late 1970s has not only faded but reversed. This leaves the question of whether change in the relative size of groups has substantially contributed to the overall decline of partisanship between 1977 and 2002. After all, it might well be the case that the decline in the number of workers, who are now less likely to identify with one of the major parties than the average citizen has canceled out the decline in the number of frequent churchgoers, who still have a disproportionally high share of identifiers among them. In short, this might be precisely what is going on here: In 2002, the predicted share of citizens identifying with one of the two major party, found by averaging over the individual predicted probabilities for holding such a PID, is 60.6 percent.33 If this procedure is repeated after weighing the data so that the groups defined by religion, class, and church attendance have the same relative sizes as in 1977, the predicted share of citizens identifying with either SPD or CDU/CSU is virtually identical, namely 60.0 percent. Essentially, this means that change in the composition of society has virtually no net-effect on the level of partisanship in Germany. The observed decline of partisanship is almost solely due to the weakening of traditional social ties. The task of this paper was to investigate whether and how partisanship in West Germany has declined since the late 1970s. While the various strands of dealignment theory suggest an almost glacial decline in the number of identifiers, many scholars of ‘Parteienverdrossenheit’ uphold that political crises, scandals, and other deficiencies of the established parties led to a rather sudden change in the relation between citizens and parties. Individual-level analyses of the Politbarometer polls which have been conducted since 1977 on a monthly base show that there is no empirical evidence for such a swift breakdown of partisan loyalties. Partisanship has not suddenly evaporated but is – some short-time fluctuations notwithstanding – slowly and constantly declining. This decline, which amounts to an estimated loss of 16 percentage points, is neither a consequence of the cognitive mobilization effect proposed by Dalton nor can it be explained by the shrinking of traditional social groups. Rather, it is caused by a weakening of traditional social ties that is especially pronounced within the remains of Germany’s once-proud working class, which has traditionally supported the Social Democrats. As discussed in the introduction, the processes that might bring about this weakening are manifold, and it is beyond the scope of this article to explore which of them prevails. However, given the almost perfectly linear pattern that has governed the dealignment process for 26 years (cf the lowess smoother in figure 1) and the fact that most of these explanations assume that the weakening of social ties is in turn caused by other long-term trends, partisanship in West Germany will probably continue to wane over the next years. Theory predicts that the short-term effects of issues and candidates will become more relevant under these circumstances, and there is ample evidence that this is already happening (Dalton and Bürklin: 65-71). Therefore, the secular decline of partisanship should further change the electoral landscape of West Germany and could thereby help to lessen the gap between West Germany and the new Länder in a rather unexpected way: For once, the East, where the level of partisanship is already lower while issue- and candidate-centered voting, vote-switching, and abstention are considerably more frequent, might serve as a model for the West. Electoral politics in Germany may therefore very well become even more diverse and fluid (Dalton and Bürklin 2003: 73) than they already are. Arzheimer, K., 2002. Politikverdrossenheit. Bedeutung, Verwendung und empirische Relevanz eines politikwissenschaftlichen Begriffes. Westdeutscher Verlag, Wiesbaden. Betz, H.-G., 1994. Radical Right-Wing Populism in Western Europe. Macmillan, Houndmills, London. Campbell, A., Converse, P. E., Miller, W. E. and Stokes, D. E., 1960. The American Voter. John Wiley, New York. Crouch, C., 1999. Social Change in Western Europe. Oxford University Press, Oxford. Dalton, R. J. 1984. Cognitive Mobilization and Partisan Dealignment in Advanced Industrial Democracies. Journal of Politics 46, 264-284. Dalton, R. J. and Bürklin, W. 2003. Wähler als Wandervögel. Dealignment and the German Voter. German Politics and Society 21(66), 57-75. Dalton, R. J. and Rohrschneider, R., 1990. Wählerwandel und die Abschwächung der Parteineigungen von 1972 bis 1987. In: Kaase, M. and Klingemann, H.-D. (Eds. ), Wahlen und Wähler. Analysen aus Anlaß der Bundestagswahl 1987. Westdeutscher Verlag, Opladen, pp. 297-324. Dalton, R. J., 2000. The Decline of Party Identifications. In: Dalton, R. J. and Wattenberg, M. P. (Eds. ), Parties without Partisans. Oxford University Press, Oxford, pp. 19-36. Dalton, R. J., Beck, P. A. and Flanagan, S. C., 1984. Electoral Change in Advanced Industrial Democracies. In: Dalton, R. J., Flanagan, S. C. and Beck, P. A. (Eds. ), Electoral Change in Advanced Industrial Democracies: Realignment or Dealignment. Princeton University Press, Princeton, pp. 3-22. Eilfort, M., 1996. Politikverdrossenheit and the Non-Voter. In: Roberts, G. K. (Ed. ), Superwahljahr: The German Elections in 1994. Frank Cass, London, pp. 111-119. Falter, J. W. 1977. Einmal mehr: Läßt sich das Konzept der Parteiidentifikation auf deutsche Verhältnisse übertragen? Theoretische, methodologische und empirische Probleme einer Validierung des Konstrukts ‘Parteiidentifikation’ für die Bundesrepublik Deutschland. Politische Vierteljahresschrift 18(2/3 (‘Wahlsoziologie heute’, hrsg. von Max Kaase)), 476-500. Falter, J. W. and Rattinger, H., 1997. Die deutschen Parteien im Urteil der öffentlichen Meinung von 1977-1994. In: Gabriel, O. W., Niedermayer, O. and Stöss, R. (Eds. ), Parteiendemokratie in Deutschland. Westdeutscher Verlag, Opladen, pp. 495-513. Falter, J. W. and Rattinger, H., 2001. Die deutschen Parteien im Urteil der öffentlichen Meinung von 1977-1999. In: Gabriel, O. W., Niedermayer, O. and Stöss, R. (Eds. ), Parteiendemokratie in Deutschland. Westdeutscher Verlag, Opladen, pp. 484-503. Falter, J. W., Gabriel, O. W. and Rattinger, H. (Eds. ), 2000a. Wirklich ein Volk? Die politischen Orientierungen von Ost- und Westdeutschen im Vergleich. Leske und Budrich, Opladen. Falter, J. W., Schoen, H. and Caballero, C., 2000b. Dreißig Jahre danach: Zur Validierung des Konzepts “Parteiidentifikation” in der Bundesrepublik. In: Klein, M., Jagodzinski, W., Mochmann, E. and Ohr, D. (Eds. ), 50 Jahre Empirische Wahlforschung in Deutschland. Westdeutscher Verlag, Wiesbaden, pp. 235-271. Fuchs, D., 1999. The Democratic Culture of Unified Germany. In: Norris, P. (Ed. ), Critical Citizens. Global Support for Democratic Government. Oxford University Press, Oxford u.a., pp. 123-145. Fuchs, D., Gudiorossi, G. and Svenson, P., 1995. Support for the Democratic System. In: Klingemann, H.-D. and Fuchs, D. (Eds. ), Citizens and the State. Oxford University Press, Oxford u.a., pp. 323-353. Gabriel, O. W. 1993. Institutionenvertrauen im vereinigten Deutschland. Aus Politik und Zeitgeschichte 43(B 43), 3-12. Gluchowski, P. and Wilamowitz-Moellendorff, U. v., 1998. 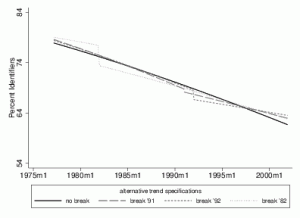 The Erosion of Social Cleavages in Western Germany, 1971-97. In: Anderson, C. J. and Zelle, C. (Eds. ), Stability and Change in German Elections. How Electorates Merge, Converge, or Collide. Praeger, Westport, London, pp. 13-31. Goldsmith, M., 1995. The Growth of Government. In: Borre, O. and Scarbrough, E. (Eds. ), The Scope of Government. Oxford University Press, Oxford, pp. 25-54. Green, D. P., Gerber, A. S. and DeBoef, S. L. 1999. Tracking Opinion over Time. 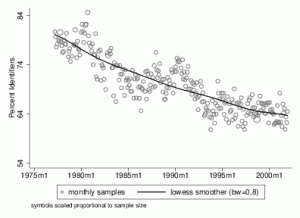 A Method for Reducing Sampling Error. Public Opinion Quarterly 63, 178-192. Heitmeyer, W., Möller, K. and Siller, G., 1990. Jugend und Politik. Chancen und Belastungen der Labilisierung politischer Orientierungssicherheiten. In: Heitmeyer, W. and Olk, T. (Eds. ), Individualisierung von Jugend. Gesellschaftliche Prozesse, subjektive Verarbeitungsformen, jugendpolitische Konsequenzen. Juventa, Weinheim, München, pp. 195-217. Inglehart, R., 1984. The Changing Structure of Political Cleavages in Western Society. In: Dalton, R. J., Flanagan, S. C. and Beck, P. A. (Eds. ), Electoral Change in Advanced Industrial Democracies: Realignment or Dealignment. Princeton University Press, Princeton, pp. 25-69. Jaccard, J., 2001. Interaction Effects in Logistic Regression. Sage, Thousand Oaks, London, New Delhi. Katz, R. S. and Mair, P. 1995. Changing Models of Party Organisation and Party Democracy. The Emergence of the Cartel Party. Party Politics 1, 5-28.
emergence of the cartel party. Party Politics 1, 5-28. Kepplinger, H. M., 1998. Die Demontage der Politik in der Informationsgesellschaft. Alber, Freiburg, München. Kitschelt, H., 1994. The Transformation of European Social Democracy. Cambridge University Press, Cambridge. Kitschelt, H., 1995. The Radical Right in Western Europe. A Comparative Analysis. The University of Michigan Press, Ann Arbor. Küchler, M., 1985. Ökonomische Kompetenzurteile und individuelles politisches Verhalten: Empirische Ergebnisse am Beispiel der Bundestagswahl 1983. In: Oberndörfer, D., Rattinger, H. and Schmitt, K. (Eds. ), Wirtschaftlicher Wandel, religiöser Wandel und Wertwandel. Duncker und Humblot, Berlin, pp. 157-182. Küchler, M., 1990. Ökologie statt Ökonomie: Wählerpräferenzen im Wandel? In: Kaase, M. and Klingemann, H.-D. (Eds. ), Wahlen und Wähler. Analysen aus Anlaß der Bundestagswahl 1987. Westdeutscher Verlag, Opladen, pp. 419-444. Lebo, M. J. and Clarke, H. D. 2000. Editorial: Modelling Memory and Volatility: Recent advances in the Analysis of Political Time Series. Electoral Studies 19, 1-7. Little, R. J. A. and Rubin, D. B. 1989. The Analysis of Social Science Data with Missing Values. Sociological Methods and Research 18, 292-326. Maier, J., 2000. Politikverdrossenheit in der Bundesrepublik Deutschland. Dimensionen – Determinanten – Konsequenzen. Leske und Budrich, Opladen. Maier, J., 2003. Die üblichen Verdächtigen oder zu unrecht beschuldigt? Zum Einfluß politischer Skandale und ihrer Medienresonanz auf die Politikverdrossenheit in Deutschland. Bamberger Beiträge zur Politikwissenschaft Working Paper Series Nr. II-12. Universität Bamberg, Bamberg. Mair, P., Müller, W. C. and Plasser, F., 1999. Veränderungen in den Wählermärkten. Herausforderungen für die Parteien und deren Antworten. In: Mair, P., Müller, W. C. and Plasser, F. (Eds. ), Parteien auf komplexen Wählermärkten. Reaktionsstrategien politischer Parteien in Westeuropa. Signum, Wien, pp. 11-29. Neu, V. and Zelle, C., 1992. Der Protest von Rechts. Kurzanalyse zu den jüngsten Wahlerfolgen der extremen Rechten. Konrad-Adenauer-Stiftung, St. Augustin. Pappi, F. U. 1973. Parteiensystem und Sozialstruktur in der Bundesrepublik. Politische Vierteljahresschrift 14, 191-213. Ragnitz, J., 2001. Aufholprozess der neuen Bundesländer – die Rolle der öffentlichen Transferleistungen. In: Döhler, E. and Esser, C. (Eds. ), Die Reform des Finanzausgleichs – neue Maßstäbe im deutschen Föderalismus? VWF, Berlin, pp. 87-99. Reiter, H. L. 1989. Party Decline in the West. A Skeptic’s View. Journal of Theoretical Politics 1, 325-348. Roberts, G. K., 2000. The Ever-Shallower Cleavage: Religion and Electoral Politics in Germany. In: Broughton, D. and ten Napel, H.-M. (Eds. ), Religion and Mass Electoral Behaviour in Europe. Routledge, London, New York, pp. 61-74. Schafer, J. L. and Olsen, M. K. 1998. Multiple Imputation for Multivariate Missing-Data Problems: A Data Analyst’s Perspective. Multivariate Behavioral Research 33, 545-571. Zelle, C., 1998. A Third Face of Dealignment? An Update on Party Identification in Germany, 1971-94. In: Anderson, C. J. and Zelle, C. (Eds. ), Stability and Change in German Elections. How Electorates Merge, Converge, or Collide. Praeger, Westport, London, pp. 55-70. 1 Unlike other political or non-political associations, a party can only be dissolved if a super-majority in the Federal Constitutional Court rules that it works against democracy. This has happened only twice during the Federal Republic’s early years when both the neo-fascist Sozialistische Reichspartei (SRP) and the communist Kommunistische Partei (KPD) were banned. 2 While in theory up to 50 percent of their income may come from the treasury, this share is quite often even higher once tax and other benefits are considered. 3 The last successful independent candidates for the federal parliament ran in 1949. 4 There are actually two Christian democratic parties: The Christlich Soziale Union (CSU), which is restricted to the Land of Bavaria, and the larger Christlich Demokratische Union (CDU), which runs candidates in all other Länder. Since the two parties do not compete and have always formed a common delegation in the federal parliament, they are treated as one single party to which I refer to as CDU/CSU for brevity’s sake. 5 Even worse, the East German economy slumped although the Kohl-government, who had effectively reduced public spending through its first two terms (Goldsmith 1995: 36-38), initiated an unprecedented transfer of public money to the East. Between 1991 and 1999 alone, the net transfers from the federal government and the West German Länder governments amounted to a sum of more than 1.2 trillion Deutschmarks (Ragnitz 2001: 87). This transfer is one of the main reasons for the massive budget deficit that Germany has build up since the early 1990s, which in turn substantially restricts the leeway for political decisions and necessitates a substantial reduction of public spending, with more severe cuts to come. 6 Roughly one third of all the publications surveyed by Arzheimer (2002) were published during these two years. 7 For similar outlines of these propositions see e.g. Dalton and Rohrschneider (1990), Gluchowski and Wilamowitz-Moellendorff (1998), Zelle (1998), and Mair et al. (1999). 8 See Zelle (1998: 57-58) for a similar distinction between ‘social dealignment’ and ‘political frustration’. The idea of a swift breakdown is especially prominent in the literature that focuses on the period immediately following unification. Examples include Heitmeyer et al. (1990: 197-198), who claim that there is a ‘rapid’ decline of PID and an ‘enormous growth’ in voting for the (non-established) extreme right, Neu and Zelle (1992: 5), who discuss a recent decline in political trust and political satisfaction and state that trust in parties has fallen to ‘record lows’ since the late 1980s, Arnim (1992: 14), who holds that disaffection with the established parties is now ‘by far exceeding the usual level of resentment’, Gabriel (1992: 10), who claims that the federal government and the Bundestag as well as several other ‘institutions of the party state’ faced a substantial decline in confidence between 1991 and 1992, and Betz (1994: 55), who saw ‘a dramatic rise in … Parteien- and Politikverdrossenheit … which was sweeping the country’. Looking back, even Maier (2003: 8-10) still claims that disaffection with democracy has ‘substantially’ grown between 1991 and 1993, and that disaffection with parties grew ‘very fast’ after unification. While most of these authors actually take a cautious stand and couch the idea of a swift and sudden decline of party identification in terms of a working hypothesis, it was often presented as a given fact by many politicians, journalists and pundits in the public discourse. 9 The proliferation of election studies that adopted the model outlined in Campbell et al. 1960 sparked a lively debate in Germany on the application of the concept in general as well as on the appropriate measurement of party identification. While some authors (e.g. Küchler 1985; 1990) claim that the standard question is nothing more than an alternative measure for voting intention, the arguments in favor of the standard question presented by Falter 1977 have settled the matter for the majority of scholars. Falter et al. 2000b give a useful summary of the debate and present convincing evidence on the validity of the concept in the German concept. 10 Of course, neither the Central Archive nor the principal investigators bear any responsibility for the analyses reported in this article. The combined data set for the years from 1977 to 2001 is available from the Central Archive under filing number 2391. A Stata do-file that can be used to replicate the results is available from the author upon request. 11 As one would expect in the case of public opinion time series data, the residuals show a substantial degree of positive serial correlation. The first-order autocorrelation is estimated as 0.46 in a Prais-Winsten regression of the share of identifiers on time. While it is tempting to interpret the resulting sine-like pattern as evidence for an effect of the electoral cycle on (aggregate) partisanship, this is conjecture not borne out by the data: In 1987 and 1998, the share of identifiers rose only after the respective general elections, while a phase of (relative) decline set on in 1990 clearly before election day. A formal test for effects of the electoral cycle requires the inclusion of variables measuring the number of months passed since the last and the number of months remaining until the next election. But while both coefficients exhibit the expected negative sign, they are neither on the aggregate nor on the individual level significantly different from zero. The minimum of both variables, i.e. the proximity to either the last or the next general election, has a significant effect, but its substantial impact is negligible. The probabilities for holding a PID predicted from aggregate as well as individual-level models change by a maximum of less than two percentage points, with a mean difference of 0.2 percentage points on the aggregate and .0004 percentage points on the individual level (as estimated by model 4). Since such tiny differences are not visible in the plots presented later on, and the intention was to keep the models parsimonious, none of these variables were included in the final models. Moreover, note that the amount of ‘noise’ is modest (the linear trend captures slightly more than 90 per cent of the total variance in the Prais-Winsten regression), and is for most of the surveys within the range of what is expected to arise from (multi-stage) sampling error. 12 Falter and Rattinger as well as Maier apply the same methodology to a whole host of aggregate measures (e.g. share of citizens with intention to vote, average ‘feeling’ towards several parties etc. ), which are of no immediate interest here. 13 Given that the true share of identifiers is constant (say 70 percent) over the course of four weeks, 95 percent of the observed differences between two surveys of a monthly poll with n=1000 apiece would still fall within an interval as big as ±4 percentage points. This interval gets even wider if (a) the share of identifiers comes closer to 50 percent and (b) the multi-stage sampling design is taken into account. Therefore it becomes difficult to separate systematic change from random noise. 14 In fact, this is a specifically crude instance of eyeballing, since the period after unification is used for the calculation of both the overall and the post-unification coefficient. 15 Time was measured in months passed since March 1977. 16 The former GDR became part of the Federal Republic in October 1990, but the ‘founding election’ of the unified German was held two months later. Therefore, the dummy variable takes a value of 0 for all months prior to January 1991 and a value of 1 from thereon. 17 For model 1d, only the sum of the trend term and the interaction significantly differs from zero, i.e. the downward trend is significant only from 1982 on. For models 1b and 1c, both the trend term (i.e. the slope before the alleged structural change) as well as the sum of trend and interaction (i.e. the slope after the change has occurred) are significantly different from zero. 18 For 75% of the months, the difference between the highest and the lowest of the four predictions is less than 1.7 percentage points. The maximal difference between the highest and the lowest prediction is 2.2 percentage points (October/November 1981). 19 The mean per-year change estimated by Model 1a amounts to a decline of 0.7 percentage points per year. The estimated mean yearly changes for Models 1b-d are 0.6, 0.6, and 0.7 percentage points respectively. 20 To add an additional margin of safety, a specification search was run. Every month from March 1978 on was in turn treated as a potential watershed for PID. This yielded a maximal estimated drop of 6.1 percentage points as early as in the winter 1980/1981, and a positive slope up to that point. Both the increase in partisans and the following drop in their number are probably due to the immensely polarizing campaign for the general election of 1980, which ended in October. However, from the early 1980s on, this specification and the trend-only model yield again almost identical predictions. 21 With a subset of the Politbarometer data that includes only the years 1977 and 1995, Dalton (2000: 33) finds a very weak positive relation between education and PID for 1977 and a negative interaction between education and time that is not statistically significant. 22 This is only a partial test of the cognitive mobilization hypothesis, because the original concept involves education and political interest. Unfortunately, information on political interest is not available in the vast majority of the Politbarometer surveys. Moreover, the wording of the respective question was altered in a major way in 1992, rendering the item useless for the analysis at hand. However, since there is usually a sizeable correlation between education and political interest, substantial effects of cognitive mobilization should be detectable even though only education is considered here. 23 In this context, frequent churchgoers are respondents who claim that they attend church ‘every Sunday’ or ‘almost every Sunday’. 24 This variable is based on a self-assessment of the respondent’s current or (in the case of pensioners and unemployed people) last occupation. Therefore, ‘workers’ are those respondents who see their current/last occupation as a working class job, ‘non-workers’ are all those who do not subscribe to such a statement. Although more elaborate classification schemes exist, this simple variable is quite appropriate for the research question at hand since a person’s social-psychological identification will rather be related to a subjective self-assessment than to objective criteria of class membership that are derived from current occupation. This still leaves the problem of a small group of respondents who were never in employment but might see themselves as members of the working class, because they their spouse is a worker or because they grew up in a working class family. Unfortunately, information on these variables is extremely scarce or non-existent in the surveys. 25 There is some evidence that part of the decline in the share of workers is due to a change from personal to telephone-based interviews. This notwithstanding, official sources (i.e. social security records) show that the number of workers has massively declined over the last decades. 26 After excluding those who identify with a minor party, the number of cases is 267,797. However, respondents who did not provide complete information on class, religion, and church attendance had to be excluded as well, which effectively reduced the sample size to 184,848. Although it would have been preferable to use multiple imputation techniques (see Little and Rubin 1989; Schafer and Olsen 1998), given the large number of cases, these computationally-intensive methods were simply not feasible. 27 At least, a kind of ‘ceiling effect’ is expected to occur because membership in these two groups incites citizens to identify with two competing parties, while the measure of PID does not allow for dual identification. 28 Adding a lot of interaction terms is likely to result in a problem of multicollinearity. Indeed, for five of the variables, the Variance Inflation Factor (VIF) exceeds the threshold of 10, with a maximum value of 25.3 for the three-way-interaction. The amount of multicollinearity could be substantially reduced by centering the time variable at its mean. However, since (1) even a value of 25 is not excessive, (2) no problems occurred during estimation and (3) multicollinearity does neither effect the likelihood nor the quantities of interest (i.e. the predicted probabilities), the original scale of the time variable was retained so that the coefficients can be interpreted analogously to the ones given in tables 1-3. 29 Since there is an interaction between being a worker and being Catholic in the equation, the main effect applies to non-Catholic workers only. 30 Again, the main effect of Catholicism applies to non-churchgoing Catholics only, because there is an interaction between Catholicism and church attendance in the equation. 31 If the share of party identifiers among frequent churchgoers had been stable between 1977 and 2002, the effect of church attendance would have become stronger over time, i.e. the interaction with time would be significantly positive and of a non-trivial magnitude. 32 The predicted share of identifiers among non-Catholic workers who occasionally attend church was about 1.3 percent lower in 1977 and roughly 0.6 higher in 2002. Therefore, the changing effect of Catholicism among occasional churchgoers did not substantially contribute to the decline in partisanship within this group. 33 This is reasonably close to the empirical figure of 61.2 percent.